Dividend stocks don't get much better than this. What if you could simultaneously tap into a meaningful dividend yield, dividend growth, and an undervalued stock all in a single investment? With Apple (NASDAQ:AAPL) stock, this is what you get. Here's why Apple is one of my favorite dividend investments, especially after the stock's recent pullback. For any investor looking to give his portfolio a boost from a dividend stock, a decent dividend yield is likely a requirement. Fortunately, Apple's stock's dividend yield, or annual dividend payments as a percentage of the stock price, has moved higher in the past 30 days thanks to the stock's 10% pullback during this time. 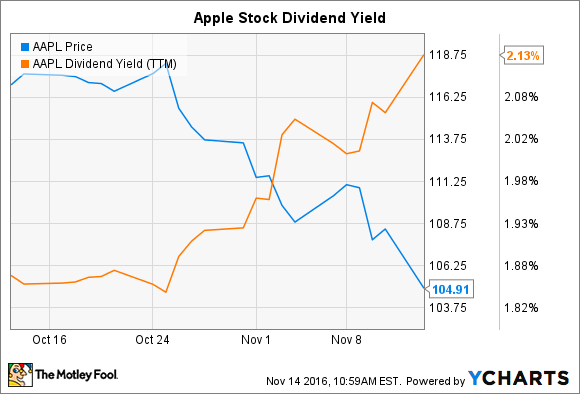 Today, Apple's dividend yield is about 2.1%, a meaningful jump from a 1.9% dividend yield just one month ago. While some investors may gloss over Apple's 2.1% dividend yield, which is about in line with the average dividend yield of stocks in the S&P 500, it starts to get interesting when investors look at the dividend's growth potential. The prospects for Apple's dividend growth are evident both by the dividend's recent growth history and a look at the cash flow supporting the tech giant's dividend payments. Apple's recent annual dividend increases, along with management's admission that it plans to continue to increase the dividend every year, highlight a rapid growth trajectory for dividend payouts. Since 2012, for instance, Apple's quarterly dividend payments have increased by about 51%, or a compound annual growth rate of 10.8%. Further, Apple's most recent dividend increases remain robust, with 10.6% and 9.6% hikes in 2015 and 2016, respectively. And perhaps making an even stronger case for Apple dividend's growth potential is the company's strong free cash flow. In the trailing 12 months, Apple generated an incredible $52.3 billion in free cash flow, yet paid out only $12.2 billion in dividends. Clearly, the company has plenty of room to maintain its annual dividend hikes. Another way to look at Apple's room for further dividend increases is with the payout ratio, or dividend payments as a percentage of earnings. Apple's payout ratio is just 24.8%. For comparison, dividend stocks McDonald's, IBM, and Microsoft have payout ratios of about 67%, 44%, and 69%, respectively. Finally, one of the best reasons to buy this dividend investment is that the stock is arguably undervalued. Trading at about 13 times earnings, Apple stock looks considerably cheaper than the average P/E ratio of companies in the S&P 500 of approximately 24. Sure, Apple's earnings per share is down 10% in the trailing 12 months, suggesting there may be some merit to a conservative valuation. But with the tech giant's pricing power intact and customers as loyal as ever, Apple is likely to return to EPS growth over the long haul, making today's low P/E multiple irrational. 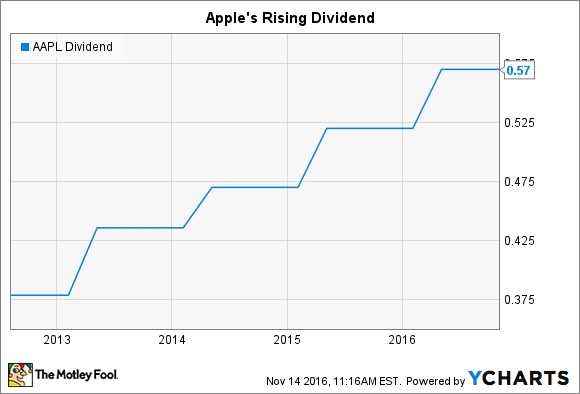 Investors who buy Apple stock today get a meaningful dividend, dividend growth, and a low-risk stock. Opportunities like this don't surface every day.